I’m very excited this month as Garden Designers Roundtable welcomes two very talented designers joining us as we discuss ‘Stone’ in the garden. Sunny Wieler of Stone Art from West Cork Ireland, and Deborah Silver of Deborah Silver and Co. from Detroit Michigan. You’ll find links to their posts as well as our GDRT members at the end of this post. Now, lets talk about stone! Stone is timeless and ancient. It tells a story. It holds us up, both literally and figuratively. Its decorative and functional. It reminds us not only of our surroundings, but ties us to a history begun millions of years ago. There is nothing that establishes a sense of place, more than stone. Here in New England, one cannot travel far without encountering stone of some kind. Our soils are rocky, our main streets are lined with building built of brick and stone made or quarried within a short distance, and forest and field are lined with miles of aged stone walls, harkening back to this region’s agrarian beginnings. 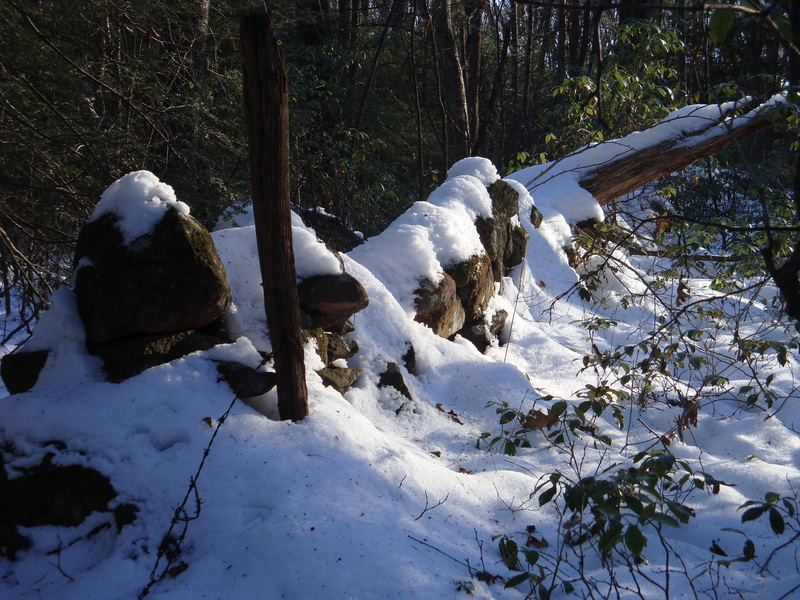 An old stone wall deep in the woods tells a tale of change to this area. 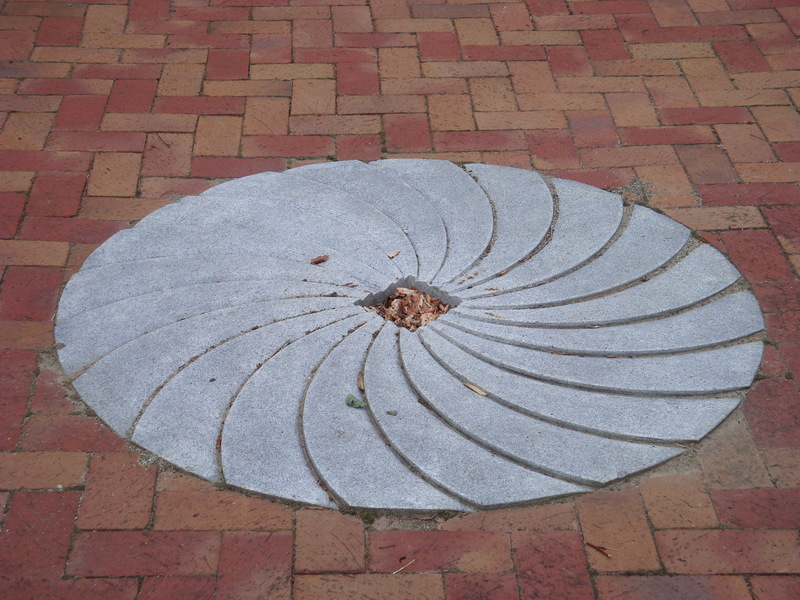 The tools used for trade and survival during those early years, often prove extremely ornamental, as this gristmill stone shows, set here into a brick patio. Gristmill stone at Hollandia Nursery. With no place to remove it to, farmers would pile stones on the edge of fields as they cleared for planting. These walls would later define properties, and eventually become ornamental boundaries. Stone wall along property frontage. A beautiful and very old step through built into a wall. 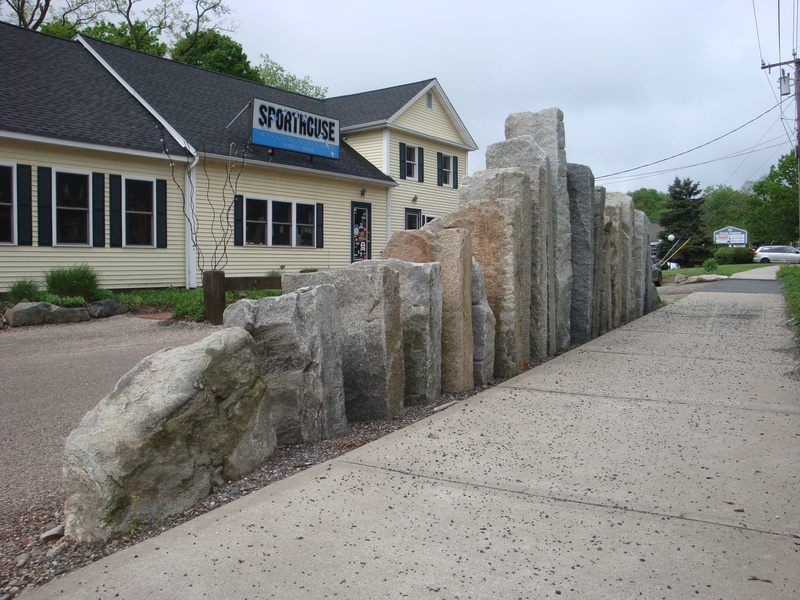 The use of native stone as ornament can also take one to a special place, or set the mood for a business, as these granite pieces do at The Sport Shop in Avon, CT. Granite hints at the craggy mountains patrons will soon ski and snowboard down. Finding interesting stone onsite adds character to the garden, and provides winter interest. Found stone on a job. Wood stone and evergreens are a match made in heaven, and when grouped together well, such as this stone, cedar trellis and Yakushimanum Rhododendron, are simply beautiful! 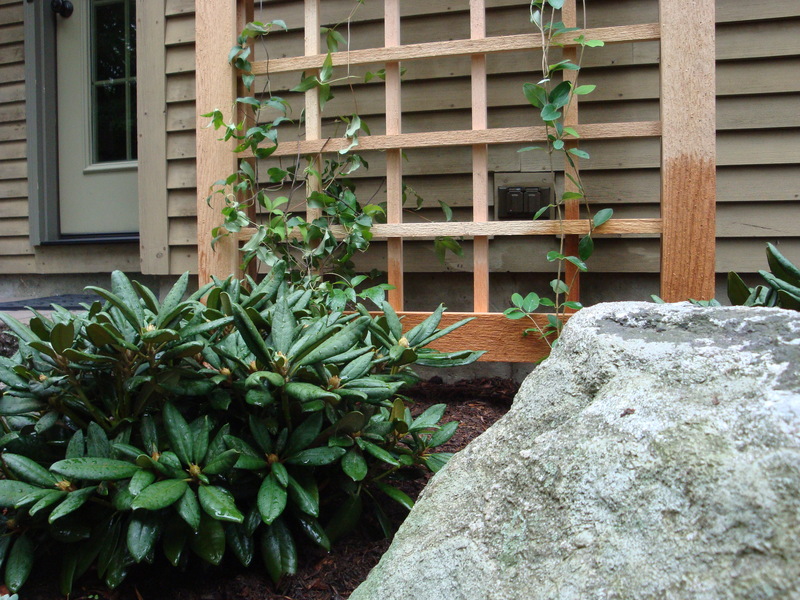 Stone, Cedar, and the dark green of a dwarf Rhododendron. This granite stoop and blue stone walk being installed, will be much more attractive than the typical precast step and concrete pavers, and will be around a lot longer. 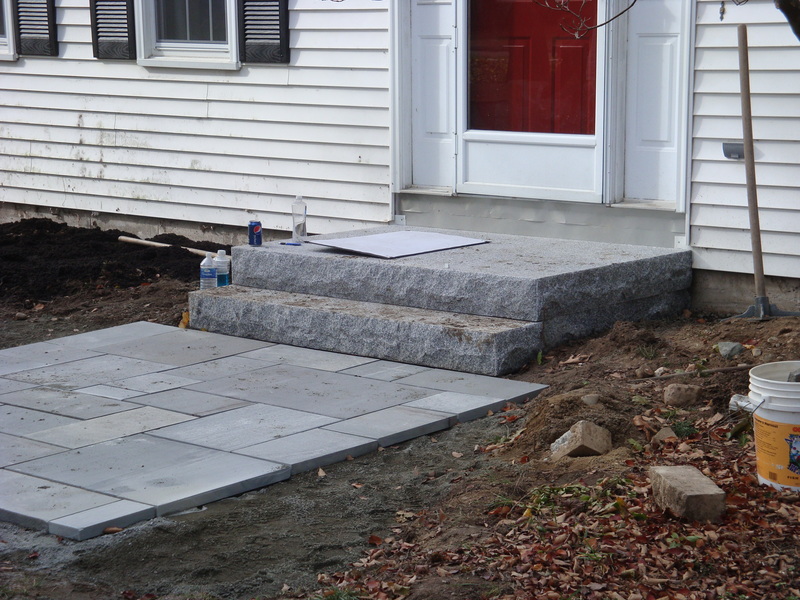 A granite stoop and bluestone walk being installed. 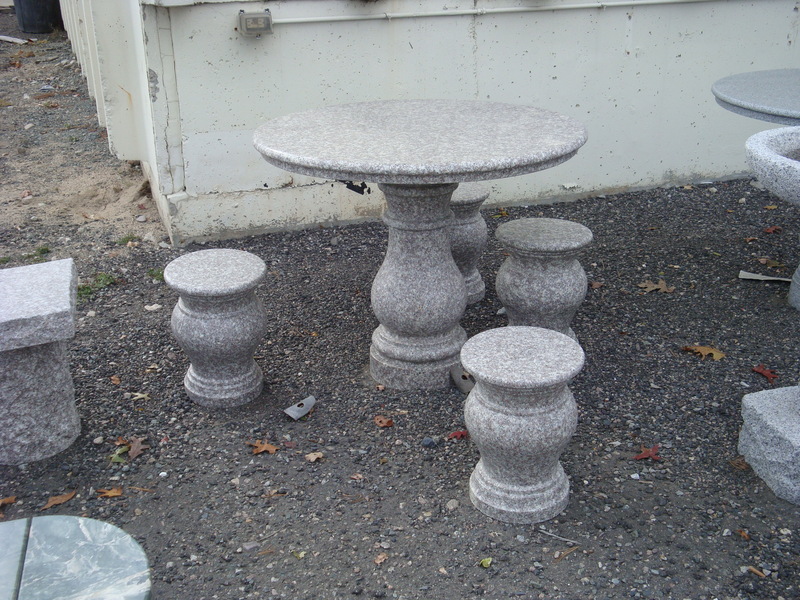 Stone can be machined also, into ornate and functional objects, such as this amazing table and chairs. How's this for a dining set for the garden? 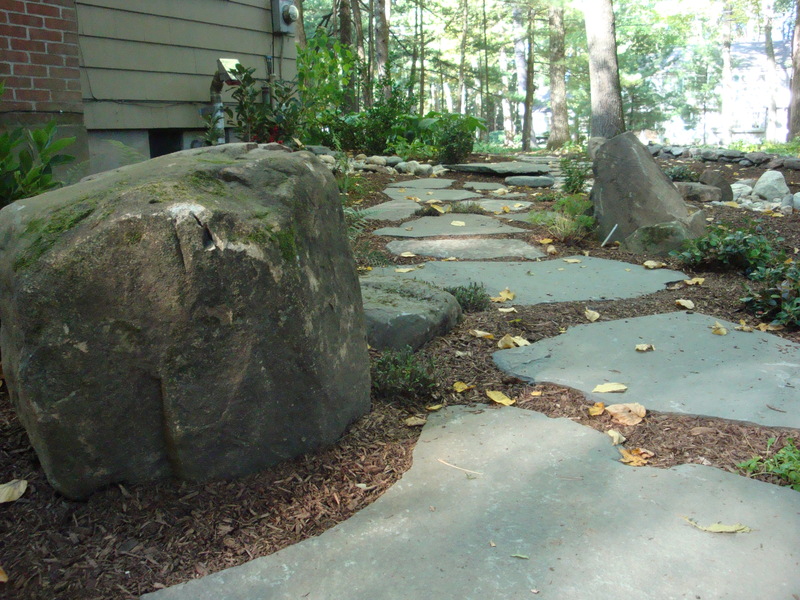 A path through a garden is will lead visitors to explore, especially if it is as lovely as this random pattern bluestone. A welcoming path in a woodland garden. 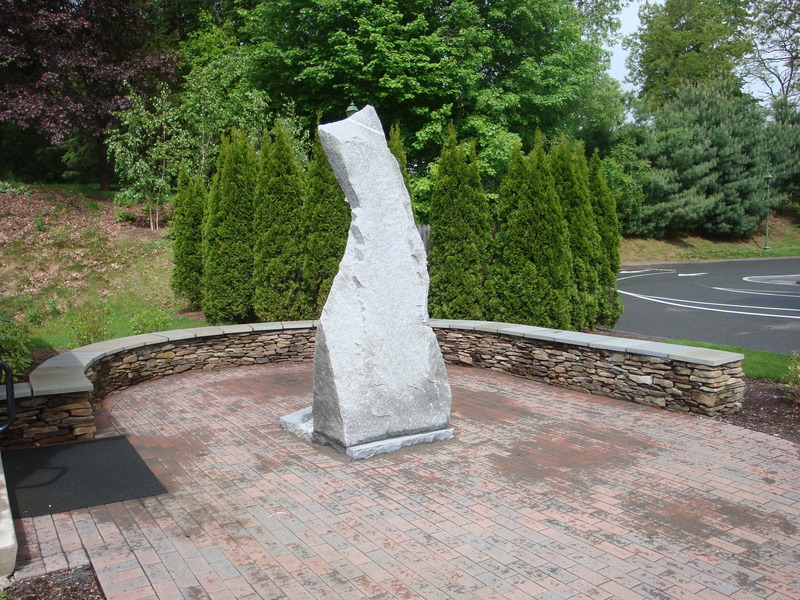 Stone can also be art without the sculpture’s chisel. This monolith is an interesting addition to this patio just outside a professional office. 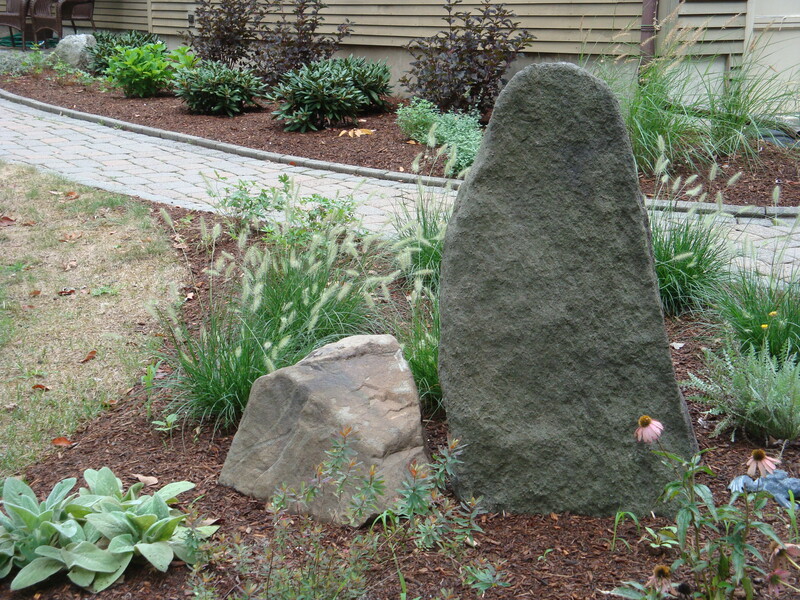 Another example of found stone, this piece of brownstone was unearthed from the very spot that it now greets visitors. 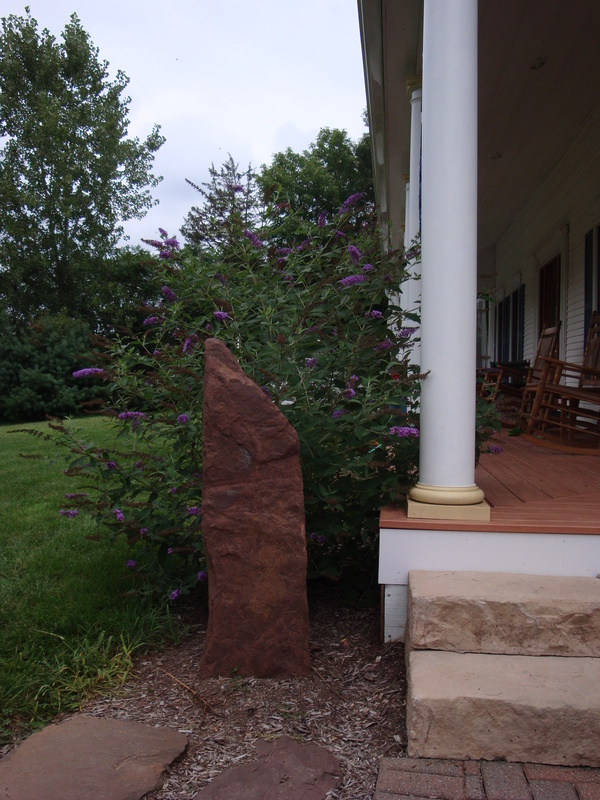 Brownstone dug from ledge beneath the porch and set as a welcome post. Use the natural materials from your site to create the sense of place within your garden, and if you are lucky enough to have stone of any kind to use, you’ll draw on the history of your site as well as the beauty. How do you feel about the use of stone in the garden? I’d love to hear your thoughts and suggestions, as would my fellow bloggers this month on the Roundtable. Please visit their blogs also, and share your thoughts! Wordless Wednesday – Canada Mayflower! Stone is the most reliable crop in our CT garden. But I have learned to love it and use it to border gardens and as an ornamental in spots. If you don’t like stone, don’t try to garden around here! That’s a great way of looking at it Heather, “A crop”. Love it! Really, what can’t stone accomplish? Even its fissures make great plant nurseries. 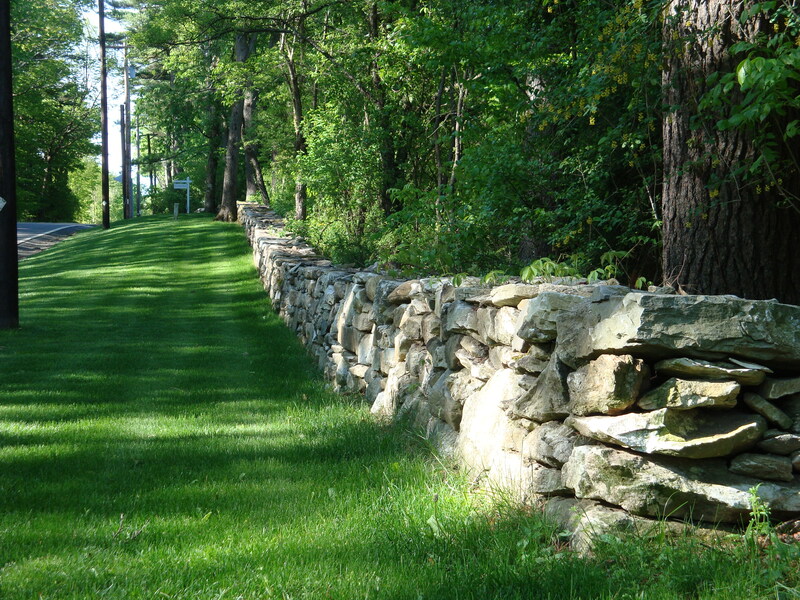 I enjoyed seeing your New England examples, Scott, particularly those iconic stone walls. They really speak to a sense of place. Thanks Pam! I agree, a very useful medium, stone is. Scott, you clearly have an affinity for stone and are a master at integrating it into your garden designs. Thanks for sharing! Thanks so much Susan! Not all pics are our work though. Scott, as a former historian, I loved your historical take on stone and also your emphasis on the importance of its local use, which is of course the only way it ever looks ‘right’!! I love the history of it also Robert, thanks for the comments! I just love the old step. I want to touch it and feel the history of a thousand feet. I know that sounds weird but that’s what your photo made me want to do! Some great stuff there Scott, I very much like the granite pieces at The Sport Shop. Thanks Sunny, that install was by a friend of mine for the owner of the Sporthouse, who in his former life was a very fine stone mason himself. Scott, What a great collection of photos. Like Susan, I love the old passage in the wall. I can just imagine all the different destinations it’s been used for over the years. Thanks Debbie, isn’t that passage great! I imagine many folks for many reasons crossing the wall there, and what it must have been like in the winter. Oh that granite STOOP! You guys are SO lucky over there to have stones GALORE!!! 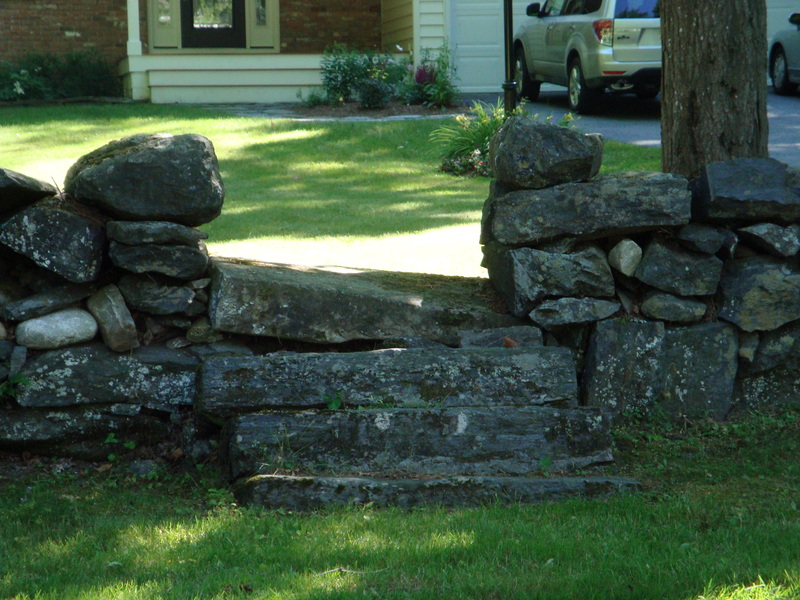 I also loved the step-through in the old stone wall- what a wonderful, practical idea, useful idea. Who needs gates? Thanks Scott! Your right Ivette the are lots of choices here in the northeast. Unfortunately, that also means that holes take a little longer to dig. Scott, I adore the mountainous accents at the sport shop! That is so fun, and yes – totally sets the mood for what the patrons will soon be doing!! A great use of stone for the location, I agree Gen! The plantings include many grasses also, and every time I pass, I think of the mountains.